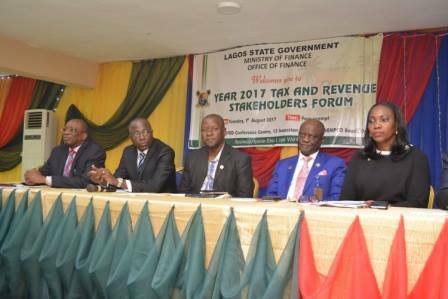 Commissioner for Finance in Lagos State, Mr Akinyemi Ashade, has revealed that the state government has concluded plans to streamline its tax and revenue collection so as to provide an enabling environment for the survival of small scale enterprises. The Commissioner explained that the proposed harmonization was in response to the appeal of Lagosians, particularly the business community, on multiple taxes collected by government. Speaking on Tuesday at the Tax and Revenue Stakeholders’ Forum organized by the Ministry at LASCOFED Conference Centre Ogba, Lagos, Mr Ashade noted that the forum was organised to address areas of conflict, streamline revenue collection in the state between the state and local governments and set up a proper channel of collection and billing. He further revealed that though the constitution gave the right to collection of levies by the different levels of government, the state and the local governments have been collaborating on the collection of levies such as Land Use Charge, which has tenement rate infused to it and is remitted to the local governments after collection. The Commissioner advised that all revenue generation agencies, particularly at the local government level, should introduce ICT technology for ease of billing and collection, stressing that it will go a long way in reducing the cost of collection, fraud and improve revenue generation. In his remarks, the Permanent Secretary in the Ministry of Finance, Mr Tairu Ogenleye, said that the purpose of the stakeholders’ forum is to move Lagos State forward. He noted that the bureaucracy and bottlenecks inherent in the current system of doing business was affecting and creating challenges for existing and potential new business/investors, especially in terms of understanding all the appropriate levies and licensing fees payable to the government at both state and local government and being able to make such payment with ease. Consequently, he informed that the present administration is looking to implement various strategies/initiatives aimed at improving the ease of doing business in the state, with a view to attracting and retaining additional foreign investment into the state.